Louisiana-based Monomoy Girl (#14, 5-1) and California's unbeaten Dream Tree (#7, 6-1) and rising star Midnight Bisou (#12, 6-1) head the list of 3-year-old fillies among 24 wagering interests set for this week's three-day run of Churchill Downs' 2018 Kentucky Oaks Future Wager (“KOFW”). Reigning 2-year-old filly champion and Breeders' Cup Juvenile Fillies (GI) winner Caledonia Road (#4, 10-1) also is on the roster of wagering interests set for the only Kentucky Oaks Future Wager Pool of 2018. The three-day wagering pool will open at noon (all times Eastern) on Friday and is scheduled to conclude at 6:30 p.m. on Sunday. The Kentucky Oaks Future pool will run concurrent to the Pool 3 of the Kentucky Derby, which also will open at noon Friday and is set to close Sunday at 6 p.m., 30 minutes prior to the close of the Kentucky Oaks bet. Wagering on the KDFW's 24 betting interests will be available at Churchill Downs and racetracks and satellite wagering outlets across North American and online via TwinSpires.com, the official betting partner of the Kentucky Derby and Breeders' Cup World Championships, and other online wagering platforms. Dream Tree and Midnight Bisou are the co-second choices in the Oaks Future Pool, which is fitting since the former defeated the latter by a nose in each of their two meetings in 2017. Three-time Kentucky Oaks winner Bob Baffert trains Dream Tree opened her 2018 season with an easy win in the Las Virgenes (GII) at Santa Anita after concluding her perfect juvenile campaign with a romp in the Starlet (GI) at Los Alamitos. Baffert saddled China Racing Club International Ltd. and Clearsky Farm's Abel Tasman to win last year's renewal of the Kentucky Oaks. Midnight Bisou, a Bill Spawr-trained daughter of Midnight Lute, has scored impressive victories this year in Santa Anita's Santa Ynez (GII) and Santa Ysabel (GIII). Champion Caledonia Road has not raced since her Breeders' Cup victory for trainer Ralph Nicks and is working in Florida in preparation for her debut as a 3-year-old. She is 2-0-1 in three career races. The roster of wagering interests for the 2018 Kentucky Oaks Future Wager: Amy's Challenge (#1, 30-1), Best Performance (#2, 30-1), C. S. Incharge (#3, 30-1), Caledonia Road (#4, 10-1), Classy Act (#5, 15-1), Coach Rocks (#6, 30-1), Cosmic Burst (#7, 50-1), Dream Tree (#8, 6-1),Eskimo Kisses (#9, 12-1), Gas Station Sushi (#10, 30-1), Heavenhasmynikki (#11, 30-1), Midnight Bisou (#12, 6-1), Midnight Disguise (#13, 30-1), Monomoy Girl (#14, 5-1), Patrona Margarita (#15, 50-1), Paved (#16, 30-1), Rayya (#17, 50-1), Red Ruby (#18, 20-1), Sassy Sienna (#19, 50-1),Spring Lily (#20, 30-1), Take Charge Paula (#21, 15-1), Thirteen Squared (#22, 20-1), Wonder Gadot (#23, 30-1) and All Others (#24, 8-1). The Kentucky Oaks Future Wager enables fans to bet on possible contenders for the 144th running of the Longines Kentucky Oaks well in advance of the May 4 running of America's top race for 3-year-old fillies. The odds available on the pool's 24 betting interests at the end of the three-day Oaks Future pool could be more attractive than those available on the day of the race. The wager is $2 minimum bet and is a win wager only. Pari-mutuel payouts on winning tickets on Kentucky Oaks Day will be determined by the pool's final odds. The pool also includes an exacta wager that requires bettors to correctly choose the top two Oaks finishers in the exact order of finish. The exacta also is a $2 minimum bet, with exacta boxes available in $1 increments. 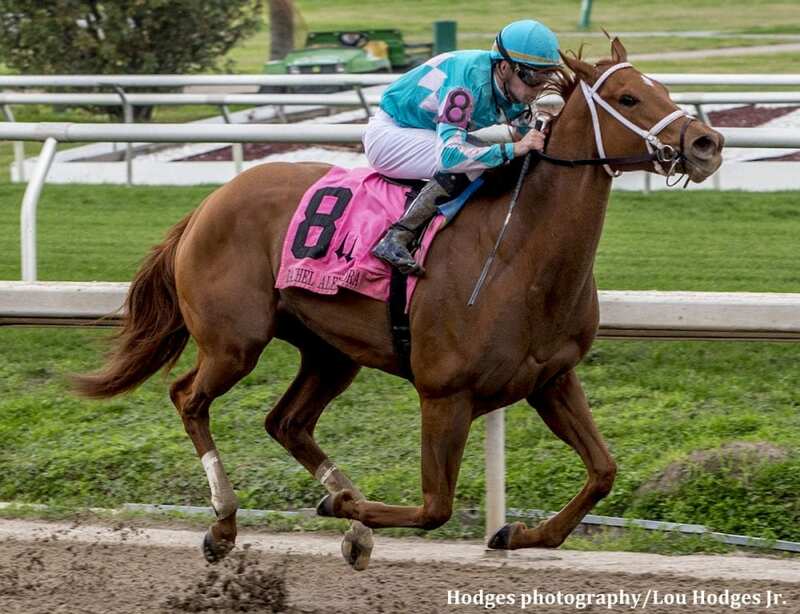 This entry was posted in Horseplayers and tagged brad cox, Handicapping, horseplayers, kentucky oaks, Kentucky Oaks Future Wager, monomoy girl, rachel alexandra stakes by Press Release. Bookmark the permalink.